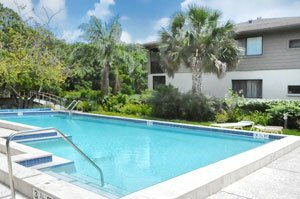 Cozy and quiet best describe the condo townhouse development of Crooked Creek in Sarasota. Its parcel is tucked in a wooded nook within the southwest quadrant of Proctor Road and South Beneva Road east of the Tamiami Trail and adjacent west to the Red Bug Slough Reserve. Given this location typical of Sarasota’s bedroom communities, it would be well-advised to link up with an expert local real estate agent on showings of available Crooked Creek condos for sale. 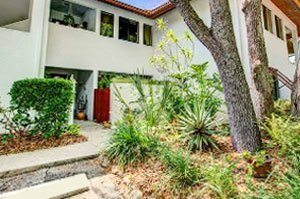 There are two access routes to these townhouses, but these are inconspicuous from the main roads of their locality in the southeast Sarasota area. One of the entrances to Crooked Creek is on its west side via South Lockwood Ridge Road northward coming from Clark Road. Another is via Austin Street, running from the east on South Beneva Road. Home-hunting in this community is a visit to a park-like residential development with its dwellings nestled amidst a lush woodland. There are 13 residential buildings in Crooked Creek, all of which are of stylish concept and construction. Most of these structures were expertly laid out alongside the curvy creek that is hallmark of this property. A small pedestrian bridge across this creek provides a charming accent to Crooked Creek’s common area which features a swimming pool, tennis court, ponds, and a picnic grove shaded by moss-bearded tree canopies frequented by lots of birds. The residences in this community were designed in perfect harmony with their iconic tropical Florida setting. Their designs are renditions from Seibert Architects whose founder is an ardent disciple of the Sarasota School of Architecture renowned for a natural but modern aura in its style. 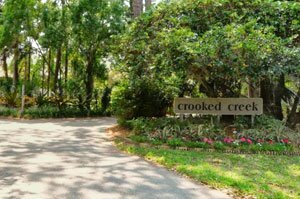 Choices on Crooked Creek condos for sale would typically range in size from approximately 1,000 square feet up to a little over 2,000 square feet. The smaller residences are one-level units with two bedrooms and two baths, with price quotes in the $100s. The asking price rises to the $200s range for Crooked Creek’s two-story townhouses which feature three bedrooms, two baths and a half-bath. Prospective buyers don’t have the luxury of time dilly-dallying on available properties in this community, as its units are rarely available and a sales listing could immediately be grabbed on the market. Living in this community entails low maintenance for the homeowners. The condo fee in Crooked Creek covers not only cable TV, administrative, legal and professional fees, and property insurance but also more importantly, building, facilities and grounds repair and maintenance. Leasing and unit sales regulations in Crooked Creek help foster a close-knit community, as condo association approval and background check are required in purchase contracts. A two-year homeownership is a requirement too for leasing which is set at a six-month minimum. Aside from the onsite amenities of Cross Creek, its residents can easily access the facilities available at the nearby Red Bug Slough Preserve for such activities as nature walks, canoeing and fishing. The neighborhood’s location near Proctor Road likewise puts residents close to local supermarkets, cafés and restaurants. Driving to the Siesta Key beaches is as convenient via Proctor Road or Clark Road, with travel time of just about 20 minutes. Below are the current real estate listings available at Crooked Creek.